We have sailed to Little Harbour to attend a party in honor of Peter Johnston's 50th birthday. We have never met Pete, as far as we know, and it's not really his 50th birthday and the whole affair is just an excuse to raise funds for a charitable organization known as "Every Child Counts." ECC is a philanthropic organization which, without benefit of governmental funding, seeks to provide educational opportunities for children with developmental disabilities. Pete's "birthday" is one of several annual fundraisers they hold. We're that much more happy to attend the party knowing that the proceeds are going for a worthy cause, but it is not really the reason we're going. We first discovered Pete's Pub in the summer of 2008. 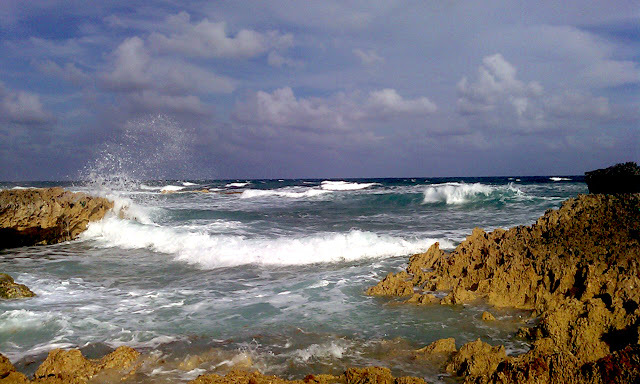 We'd decided to rent a car and drive the length of Abaco just to see what there was to see. Pete's Pub and Gallery was listed in the guidebooks and online as a not-to-be-missed stop and so, we didn't. At the time, vehicular access to Pete's Pub seemed recent. Something about the 2+ mile extension cord which T'd off the main highway and provided electricity to the pub, gallery and the rest of the Little Harbour community. We knew, we could feel it: there was just something different about this place, something real. We understood immediately why the sandy road, why the extension cord: people don't come to Pete's Pub by car; they sail here. Road access is a concession. 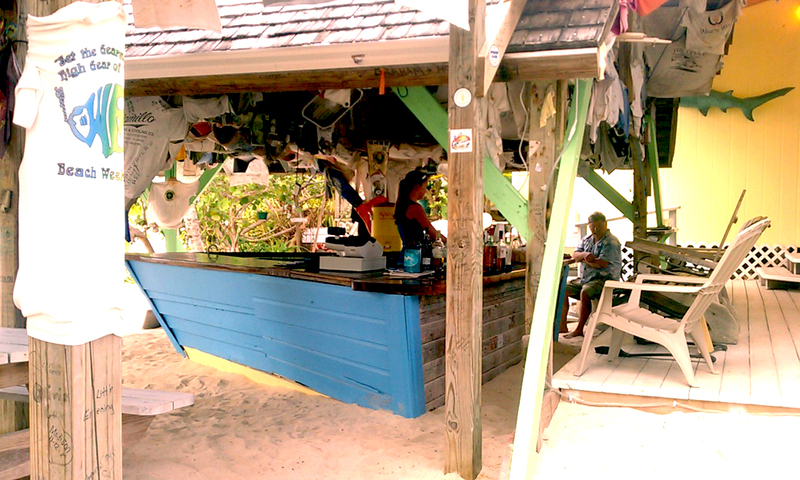 This place is the real deal, a sheltered watering hole for those who live on the sea. Ah, but I know what you're thinking. "How romantic, how idyllic." What we felt hovering near the bow shaped bar, among the few other lean, bronzed, sun-bleached hair patrons, was, as it turned out, a merest, most dilute essence of the truth of this unique place, as were were soon to discover. Back in Treasure Cay, we described our find to Trudy, at which she pulled off her bookshelf a book titled, "Artist in His Island: A Study in Self-Reliance." It is the story of one Randolph Johnston, a sculptor and visionary, who, in the mid-twentieth century, realized he could no longer tolerate living or raising his children in "the megamachine," the "supra-national military-industrial-financial complex" as coined by Lewis Mumford. Determined, in a remarkable emulation of Thoreauian ideals, Johnston set off from Connecticut with his wife and 3 sons to find a more wholesome, less co-opted way of life in a tropical paradise. He sought a place where he could concentrate on his art and where his boys could grow up learning to live in harmony with nature and lead lives of self reliance. Despite setbacks that would have daunted any mere mortal, they persisted in their dream. Today, there is a gallery, a foundry, the pub, cottages, even road access. It is a community almost entirely off the grid--not by entirely by choice, I suspect, but more so because it's too expensive to bring the grid to Little Harbour. With the exception of the extension cord, power is supplied by solar panels or generator; water by catchment in cisterns. Sewage, I don't even want to contemplate. Up a few weatherbeaten plank stairs and across a short walkway, the mighty Atlantic Ocean, always fierce here, pounds, breaks, spews against rock, turning rock into the soft sand under our feet. Timeless. Though it was below the level of everyday consciousness at the time Jane read the book, it was working on us, inspiring us from the inside out to change our lives, to opt-out of the megamachine, to find our own paradise(s). It is for this reason that Pete's 18th Annual 50th Birthday Party is more than just an island pig roast with live music, even more than a fundraiser; it is, for us, a hajj of sorts. The sands of Little Harbour we feel as we walk upon them, a hallowed ground. Perhaps in her wildest desires, but never in our wildest dreams did we think we would come back here under sail. "What we're doing now is showing us that there are an infinite number of ways to live your life," Jane remarks looking at JOY moored in the harbor. We like to think "Ran" would smile upon our endeavors. And by boat makes alot more sense than Trudy's Saab!